Our Online Banking system uses many lines of defense to protect your account information. 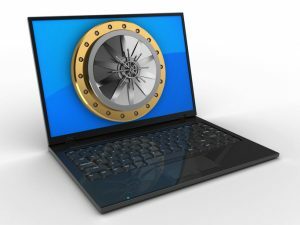 From authentication, SSL, exclusive encryption software, high-end firewalls, and automatic sign-off, your information is always safe — it’s like having a bank vault online. SSL stands for “Secure Socket Layer.” This technology allows users to establish sessions with secure Internet sites – meaning they have minimal risk of external violation. Once inside the Online Banking site, our use of SSL technology keeps you and your account information secure. Encryption turns meaningful words and phrases into coded language. Everything that you do during your Online Banking session becomes a string of unrecognizable numbers before crossing the Internet. Your account information will read as gibberish to everyone but you and our financial institution. All of your Online Banking sessions will be encrypted. We employ the strongest forms of cryptography that are commercially available for use over the Internet. Update your software frequently to ensure you have the latest security patches. This includes your computer’s operating system and other installed software (e.g. Chrome, Firefox, Adobe Flash Player, Adobe Reader, Java, Microsoft Office, etc.). Automate software updates, when the software supports it, to ensure updates are not overlooked. Password-protect your computer network (wired or wireless). Log off or lock your computer when not in use. Never click on suspicious links in emails, tweets, posts, or online advertising. Links can take you to a different web site than their labels indicate. Typing an address that you know to be correct in your browser instead of clicking a link in an email is a safer alternative. Only give sensitive information to web sites using encryption so your information is protected as it travels across the Internet. Verify the web address begins with “https://” (the “s” is for secure). Some browsers also display a closed padlock to indicate a secure site. Always “sign out” or “log off” of password protected web sites when finished to prevent unauthorized access. Simply closing the browser window may not actually end your session. Be cautious of unsolicited phone calls, emails, or texts directing you to a web site or requesting sensitive information. We will never call, email or otherwise contact you to request your username, password, or other log-in credentials for the online services we offer. If you receive such a request, do not provide any information. Contact us at (606) 679-9361 to report the incident. We may, however, request your username, social security number or other personal information to verify your identity if you contact us requesting assistance with online services. If you see suspicious activity on your account(s) or have received a suspicious call, email, letter or other similar contact regarding your relationship to Cumberland Security Bank, call (606) 679-9361 or visit your local branch. Regulation E provides rules for error resolution and unauthorized transactions for electronic fund transfers, which includes most transactions processed online. In addition, it establishes limits to your financial liability for unauthorized electronic fund transfers. These limits, however, are directly related to the timeliness of your detection and reporting of issues to Cumberland Security Bank. For this reason, we encourage you to immediately review your account statements and to regularly monitor your account activity online. Note: Regulation E does not apply to business accounts. Due to their size and frequency, business transactions are inherently more risky than consumer transactions. In recent years, there has been an increase in the number of online corporate account takeovers and unauthorized online fund transfers involving business accounts. Recently, small- to medium-sized businesses have been primary targets as cyber criminals have recognized that the security controls they have in place are not as robust as those of larger businesses. Analysis indicates enhanced controls over administrative access and functions related to business accounts and layered security using multiple and independent controls would help to reduce these types of crime. Perform a periodic risk assessment and an evaluation of the effectiveness of the controls in place to minimize the risks of online transaction processing. The password, web site, computer and network tips above provide a starting point for this process. Business customers should understand the security features of the software and web sites they utilize and take advantage of these features. Segregation of duties—the process of separating duties so no one person can perform all steps of a transaction—is an example of a very important security feature.